Q&A: What makes the World Cup soccer ball special? A 28-foot giant squid is presented in the London Natural History Museum. Although previous specimens had been fished up or found on the beach, researchers have never filmed a live giant squid in its natural habitat until now. Courtesy of Discovery News. Among the greatest mysteries of the deep sea is that of the giant squid. Ever since Norse mythology popularized it as the Kraken, this little-understood creature has become an exaggerated symbol of terror and destruction at sea, lurking in the background of countless stories and movies. But finally, after years of elusiveness, a Japanese research team finally captured the giant squid on camera in its natural habitat last July. In conjunction with the Discovery Channel, the research team observed the mammoth squid in action for the first time in history. Almost six years of research culminated in an 18-minute glimpse on camera. As the four-meter-long creature with “razor-toothed suckers and eyes the size of dinner plates” peered into a small submersible containing a pilot, scientist, and photographer, the excitement was incredible. “That’s what got me into science in the first place — this opportunity to explore a new frontier,” Edith Widder, one of the research team members, told NPR. Researchers were surprised to find that the giant squid was a metallic color that varied between silver and gold. Courtesy of Fox News. Past attempts at viewing the squid in its natural habitat involved cameras, lights, and equipment noise, and such technology had scared the creature away. Another team had fished a giant squid out of the ocean in 2006, but the creature quickly died on the hook, precluding live observation. This time, at the crushing depth of approximately 2000 feet, the team lured the squid to their location using a concoction of squid pheromones and LED lights. These lights were used to imitate the atolla, a small jellyfish that lights up in response to its larger predators. The squid was naturally attracted to this light because it feeds on the atolla’s predators. In addition to these methods, one of the most innovative techniques that the researchers employed was their use of a near-infrared (NIR) light, which is not in the spectral range of either humans or giant squids. As a subset of infrared (IR) light which ranges between 800 nanometers and one millimeter, near-infrared light ranges between 800 nanometers and 1,500 nanometers and can only be detected by humans with a specialized camera. With eyes the size of basketballs, the giant squid can detect predators from 120 meters away. Thus, equipping the submersible with near-infrared light was essential for observing it at close range. Courtesy of Norbert Wu. “Typically the operating wavelength of a camera is determined by the material used to convert photons to electrons,” said Dr. Brandon Redding, a postdoctoral researcher in optics in the Yale Applied Physics Department. “For instance, NIR cameras are often fabricated using indium gallium arsenide rather than the silicon used in most visible wavelength cameras.” Although commonly used digital cameras have receptors that are sensitive to both visible and IR light, a filter blocks out most of the IR light detected. NIR cameras essentially achieve the opposite by utilizing a special filter to block out visible wavelengths while allowing the IR light to pass through. As a figure in Norse mythology, the Kraken was commonly depicted as a marine threat that would engulf ships and terrorize sailors. Courtesy of Angelfire. 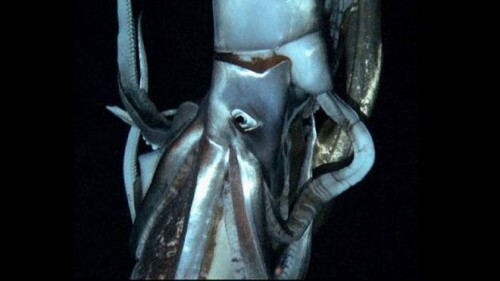 The team’s success is a big step for deep-sea research because its procedures can be adapted to observe other creatures with spectral ranges similar to that of the giant squid. This particular camera worked in the desired optical range that allowed peaceful observation of the squid, but other cameras can be built for filming other creatures as well; the potential for discovery using stealthy observation techniques is enormous. According to Widder, only 5 percent of the ocean has been explored; furthermore, that small fraction has been observed through the use of intrusive cameras and bright lights. Exploring the other 95 percent of the ocean is an exciting prospect and could very well transform our understanding of marine life altogether. “The reason we know giant squids exist is that they happen to float when they die,” said Widder. “So what about the stuff that doesn’t float when it dies?” Perhaps the “Kraken” is only the first of numerous sea creatures that have yet to be demystified.